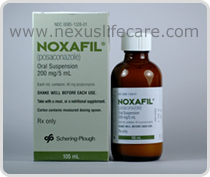 Uses :- Noxafil (posaconazole) Syrup is an antifungal medication that fights certain infections caused by fungus. Noxafil Syrup is used to prevent fungal infections in people with weak immune systems resulting from certain treatments or conditions (such as chemotherapy, stem cell transplantation, HIV infection, and others). Noxafil Syrup is also used to treat oral thrush (yeast infection of the mouth).